The Ministry of Justice in Gaza has reiterated calls on the international community and the UN to seriously investigate IOF inexorable targeting of Palestinian civilians along Gaza borders. It added in a statement on Sunday that several innocent citizens were killed and wounded at the hands of trigger-happy IOF soldiers. The ministry appealed to the international community and the UN to bring to trial Israeli leaders to genuinely investigate their atrocious crimes against Gaza’s native citizens. “Israeli violations of the rights of Palestinian civilians are flagrant breaches to the terms and verdicts of the international humanitarian law and the Fourth Geneva Convention,” the ministry declared. UN official data reveal that 4 Gazan civilians were callously killed and more than 60 others, including children and women, were left severely wounded since the start of 2014 near the Gaza border fence. The ministry acclaimed the call by the international Human Rights Watch organization to Israeli military forces to stop shooting Gaza’s non-armed civilians. The thoughtful vigilance of Human Rights Watch activists and their watchful alertness to Israeli’s crimes against Palestinian civilians, which they have corroborated via on-the-spot investigations, were very much appreciated by the ministry. A report issued by the International Human Rights Organization investigating seven incidents, taking place between 2nd January and 1st March 2014, revealed tragic upshots of IOF’s shootings of Palestinian civilians east of Gaza. According to the report, the death toll of Gazan native citizens has gone up to four, including a high school student killed while going out for a walk and a mentally-disabled old woman who was unable to find her way back home. The report further documented that several Palestinians suffered severe gunshot wounds, including two journalists and two peaceful demonstrators while they were planting olive trees. "The fact that Israeli soldiers keep on firing at Palestinian civilians near the border fence represents a brusque and intolerable infringement to the decrees of the international humanitarian law, which strictly prohibits any such ruthless attacks on civilians,” a recent Human Rights Watch report maintains. Israeli forces raided several areas in the West Bank and Jerusalem, on Sunday, kidnapping 7 and injuring two, according to reports by local, media and security sources. In the area of Salfit, Israeli forces kidnapped a youngster, aged 27, after fracturing his little brother’s hand and shattering his mother’s hand when they shut the door of a military vehicle on it, according to the Prisoner Club. The forces also raided their home, damaging the contents. In Bethlehem, the army stormed al-Doha town, to the west of the city, kidnapping a 20-year-old after breaking into and searching his home. In Hebron, the Israeli army stormed Tarqumia village and abducted two youngsters aged 26 and 31. Forces also invaded the nearby village of Samu’, taking with them one 28-year-old after raiding and searching his brother’s home. One other home was also entered and searched during the raid. On Sunday afternoon, two Palestinians were abducted and another two and wounded by Israeli forces, after they raided a shop in al-Issawiya, Jerusalem. 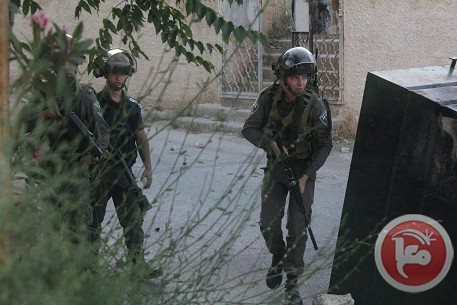 Israeli forces raided a health shop belonging to Saad Mohammad Mustafa, at the southern entrance of the village, where they assaulted the owner and one customer. One Palestinian suffered burns in his hand as forces used pepper spray, stun grenades and batons in their attacks on the people, in which they also verbally abused a number of women in the area. Mustafa was also injured, and was taken to a hospital for treatment. 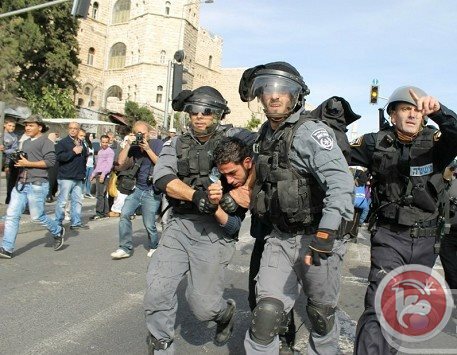 These arrests and invasions are part of daily Israeli military violations against the Palestinian people, their lands and property, in different parts of the occupied West Bank, including occupied East Jerusalem. 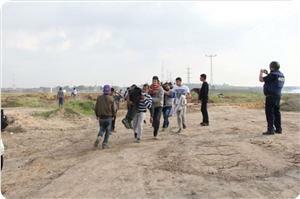 Israeli military forces clashed with local Palestinians in al-Eizariya late Sunday, witnesses told Ma'an. Locals said that Israeli forces attacked a peaceful rally organized by Fatah's youth movement in support of the al-Aqsa mosque, firing tear gas canisters and rubber-coated steel bullets. 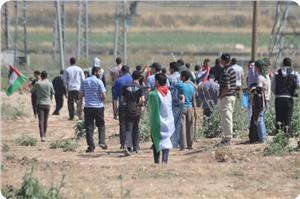 Palestinian youths hurled stones and empty bottles in response. Freelance photojournalist Rami Illariya told Ma'an that Israeli soldiers stopped him and ordered him to leave the area during the clashes because they didn't want the incident to be documented. Two Palestinian workers were wounded in northern Gaza Strip on Monday morning at the hands of Israeli occupation forces (IOF). 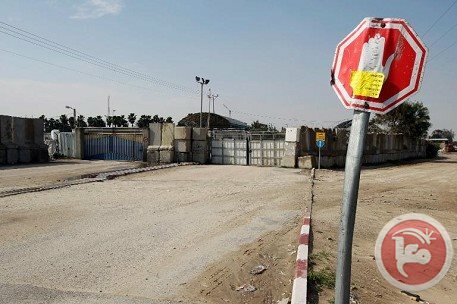 Dr. Ashraf Al-Qudra, the health ministry spokesman, told the PIC reporter that IOF soldiers in the vicinity of Beit Hanun (Erez) crossing in northern Gaza opened fire at the workers while collecting gravel. He added that the workers were hospitalized in moderate condition. IOF soldiers routinely fire at workers, usually youngsters, who collect gravel near the Gaza borders for building purposes in view of their scarcity due to the Israeli siege. Many have been wounded in similar previous incidents. Israeli forces on Sunday afternoon arrested two Palestinians and wounded another two after raiding a shop in al-Issawiya in Jerusalem. Monitoring committee member Mohammad Abu al-Homs told Ma’an that Israeli forces raided a shop for health equipment that belongs to Saad Mohammad Mustafa at the southern entrance of the village and assaulted the shop owner and a customer. Israeli forces used pepper spray, fired stun grenades, and attacked people with batons, causing a Palestinian to suffer burns in his hand. They also injured the shop owner, Mustafa, who was taken to a hospital for treatment. Israeli forces also arrested Nabil Ahmad Mustafa and Jawad Najib Shehadeh from the scene, and verbally abused women in the area, he said. A border police spokesman did not immediately return calls late Sunday. Palestinian citizens, the permanent target of Israeli attacks in the West Bank, have again suffered raids and arrests on Sunday, as several provinces, including Salfit, al-Khalil and Jenin, came under Israeli army forays. 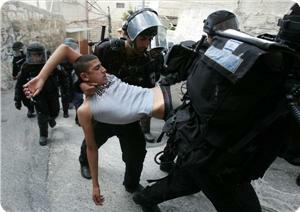 Five Palestinians were arrested and others were left wounded in the process. Palestinian Prisoner Society in Salfit documented the arrest of Sami Wasfi Mohammad Ubeid, 27, after breaking his brother’s hand and smashed his mother’s due to the brutal shutdown of the jeep’s door. Israeli occupation forces (IOF) ransacked the family’s home and ruined so much of its property. 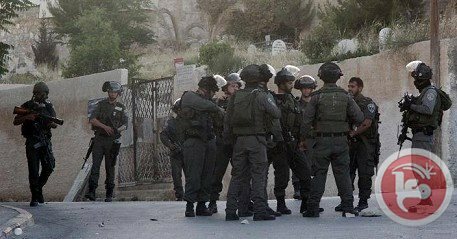 In al-Khalil, local sources said IOF raided Tarqumiya town and arrested Palestinian citizens Mohammad Hassan Abu Dabbous, 26, Mohammed Said Abu Dabbous, 31,Raed Abdul Nabi Hawamdeh,28, and Ahmad Mustafa Abdul-Ghani Hawamdeh,36 years, after having attacked their homes and rummaged through them. Local sources said that Israeli forces raided the houses of Fadi Fakhouri and Omar Haimouni, two martyrs of the Qassam Brigades (armed wing of Hamas), and summoned their brothers for interrogation. Violent clashes broke out yesterday evening in Edhna, where soldiers fired rubber and live bullets and tear gas leading to serious injuries among several Palestinian youngsters, including Mohammad Ahed Awad who was hit by a tear gas bomb in his head. IOF stormed Jenin on Sunday at dawn and carried out several combing operations in the neighborhoods of Morah, Basatine and around the public hospital. Several citizens were arrested and interrogated throughout, local sources told PIC correspondent. In the same context, a Palestinian citizen from Jenin was arrested and interrogated at a military checkpoint near the main entrance of Tulkarem. IOF served him a summons for intelligence interrogation in Salam military camp north of Jenin. Such mass arrest-campaigns coincide with IOF’s pursuit of water wells to thwart the agricultural season in the region. IOF soldiers were deployed in different areas of Ibn Amer valley where they rummaged around for wells and interrogated several farmers. According to local sources, IOF soldiers have been increasingly pursuing water wells and deliberately damaged around 20 wells in Kafardane region during the spring cucumber season, the primary source of income to thousands of Palestinian civilians. Israeli Occupation Forces (IOF) arrested all passengers in a Palestinian vehicle south of al-Khalil on Friday night under the pretext of finding a pistol in the car. Israeli radio said on Saturday that the detainees were taken to an investigation center without providing further information. Palestinian citizens are daily searched and arrested at Israeli checkpoints erected throughout West Bank under flimsy pretexts. On the other hand, Israeli forces stormed at dawn Saturday Doheisha refugee camp and Beit Fajar town, south of Bethlehem, and served summonses five Palestinian young men. Violent clashes erupted as Israeli forces fired tear gas and sound bombs while storming Doheisha camp. Dozens of houses were raided and searched by IOF soldiers, causing a state of panic among the residents. Two Palestinian youths were also arrested on Friday in the camp on charges of throwing Molotov cocktails at a military checkpoint west of Bethlehem. In a related context, Israeli forces stormed Beit Fajar town, south of Bethlehem city, and summoned two young men for investigation. 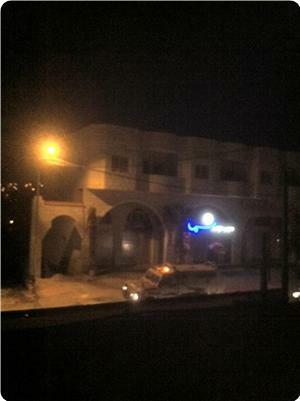 On the other hand, occupation forces stormed at dawn Saturday number of villages in Jenin, where they filmed houses. No arrests were reported. IOF erected on Saturday morning a military checkpoint on Jenin-Nablus road, where vehicles were stopped and searched. On the other hand, Israeli police prevented Muhammad Fattouh from having access to al-Aqsa Mosque for 6 months after his release from Israeli jails on condition of house arrest for 15 days and a bail of 1000 shekels. Israeli forces also arrested a Jerusalemite liberated detainee, who was recently released on condition of house arrest. Israeli Magistrate's Court has extended the arrest of 3 Jerusalemites including a minor. Israeli occupation forces (IOF) raided Hawara village, south of Nablus, at midnight Friday and forced the closure of shops. 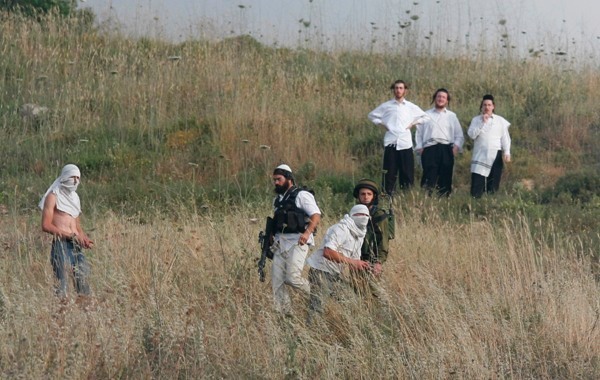 Eyewitnesses told the PIC reporter that the raid followed a firebomb attack on a settler’s car near the northern entrance of the village, adding that the soldiers ordered all shopkeepers to shut down. They added that the soldiers combed the main street in the village and the northern suburb amidst heavy firing of flare bombs. Meanwhile, Israeli daily Yediot Aronot said on Saturday that the IOF command launched military exercises on confronting attacks on its forces in the West Bank. It said that infantry brigades along with security forces entrusted with guarding settlements and border police participated in the maneuvers. A Palestinian fisherman was shot and injured by Israeli forces off the coast of the Gaza Strip early Saturday, security sources said. 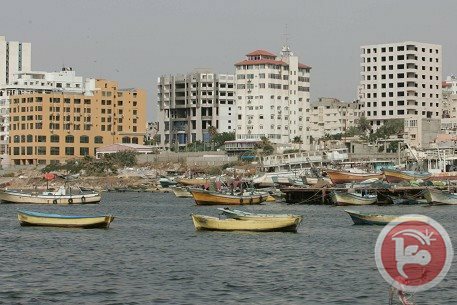 Gaza security sources told Ma'an that Israeli naval squadrons off the coast of northern Gaza fired at a Palestinian fishing boat, hitting a man in the foot. The man was taken to Kamal Udwan Hospital for treatment, the sources said. An Israeli military spokesman did not immediately return calls seeking comment. In the Oslo Accords, Israel agreed to a 20-nautical-mile fishing zone off Gaza's coast, but it has imposed a three-mile limit for several years, opening fire at fishermen who stray further. Israel must stop shooting at Palestinian civilians in the Gaza Strip, Human Rights Watch said Friday, noting four have been killed near the border fence since the beginning of 2014. A report by the New York-based watchdog cited UN data which also said more than 60 civilians were wounded by Israeli gunfire near the perimeter fence of the Palestinian enclave led by the Islamist Hamas. It focused on seven incidents between Jan. 2 and March 1, in which the four were killed and five others wounded, "none of whom posed a threat to the soldiers or others." HRW noted that "Palestinians living in the densely inhabited Gaza Strip use land near the fence with Israel for agriculture, collecting rubble, scrap metal, and other reusable materials, and recreation." "Month after month, Israeli forces have wounded and killed unarmed Palestinians who did nothing but cross an invisible, shifting line that Israel has drawn inside Gaza’s perimeter," said Sarah Leah Whitson, HRW's Middle East director. Lieutenant Colonel Peter Lerner, a spokesman for the Israeli army, did not challenge the facts but slammed the report which he said "completely ignored the reality of the state of conflict we have with Gaza, the perimeter with which is a springboard for terrorism from the Strip." "The statement ridicules human rights. This week alone we've had numerous attacks emerging from the immediate perimeter of the fence," he said. "They don't magically arrive there," Lerner said of the perpetrators. He also referred to "terror tunnels" from Gaza and projectiles fired at southern Israel. The military spokesman said "the 100-meter (yard) limit" from the border fence, which was agreed upon under the terms reached after an eight-day confrontation between Israel and Hamas militants in November 2012, was "known and widespread." "People approaching the fence are putting themselves at risk," Lerner added, noting the army fires warning shots before aiming at people. HRW maintained in its report: "While firing warning shots may reduce the likelihood of shooting a civilian, a failure to heed warning shots does not turn a civilian into a lawful military target." Human Rights Watch (HRW) on Friday called on the Israeli army to stop opening fire at Palestinian civilians inside the Gaza Strip. The international human rights group cited UN figures stating that Israeli military forces have killed four civilians and wounded more than 60 others near the perimeter fence with Gaza since the beginning of 2014. There have been no reports of armed Palestinian fighters shot in the same areas this year, HRW said in a report. HRW explained that it had investigated seven incidents between January 2 and March 1, in which Israeli forces shot civilians in the vicinity of the fence. Four of those civilians were killed, including a high school student who was on a picnic and a woman with a mental disability who was lost. 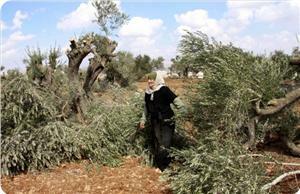 Five others were also wounded, including two journalists and two protestors planting olive trees. None of those victims posed a threat to Israeli soldiers or others, it asserted. "The Israeli military has not claimed that any of the victims in the seven cases were engaged in military operations or that armed groups were in the area when the shooting occurred," the group noted. It also pointed to the fact that "Palestinians living in the densely inhabited Gaza Strip use land near the fence with Israel for agriculture, collecting rubble, scrap metal, and other reusable materials, and for recreation." "Month after month, Israeli forces have wounded and killed unarmed Palestinians who did nothing but cross an invisible, shifting line that Israel has drawn inside Gaza’s perimeter," Sarah Leah Whitson, Middle East director of HRW, said. "It is appalling that soldiers have shot men, women, and children apparently for simply crossing a line," Whitson added. "Shooting at civilians is not a lawful policy near Gaza’s perimeter fence or anywhere else. Israeli commanders need to change their policies and practices to abide by international law, not flaunt it," she emphasized. Three Palestinians were lightly injured and one was arrested Friday during clashes with Israeli soldiers east of Jerusalem, a local popular committee spokesman said. Hani Halabiya told Ma'an that during protests in al-Eizariya and Abu Dis against "Israeli incursions into the Al-Aqsa Mosque," three young Palestinian men were hit by rubber-coated steel bullets in the lower extremities. 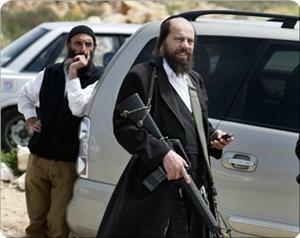 Israeli troops also detained a 28-year-old man in the area after pulling him over in his car, Halabiya said. Additionally, Israeli forces stopped a Palestinian photojournalist who works for al-Quds newspaper and forced him to delete the photos he took of the clashes.